Smaller but refined, this might be the motto for this year’s concours at the famous Breakers hotel. The main event of Cavallino Classic 28 was spoiled by rainy weather all day but the small but selected field of Ferrari Classic was still worth a visit. Smaller than in previous years especially the lower lawn featured less modern Ferrari as well as the 365 range was very thin but the upper lawn in front of the hotel was more than a compensation. Celebrating the 60th anniversary of the Ferrari 250 GT SWB the field featured 5 example of the Gran Turismo including the prototype Paris show car as well as some well-known examples making it to the show field almost every year. Before the SWB the GT class of Ferrari featured the LWB GT nicknamed Tour de France hence its victory at the French classic and two examples could be found in the field. The oldest car on show was the 166 Inter Touring Berlinetta (015S), a very early example with the baroque styling elements of Touring as seen on various Alfa Romeo of the period. With its restrained dark red colour scheme it contrasted the light blue metallic Ferrari 275 GTB Speciale and the golden 250 GT LWB California Spyder. Especially the 275 GTB drew a lot of attention being the special bodied version for Pininfarina himself featuring several very unusual elements including the rear diffusor. The car was sold just a year ago for an outstanding 8 million Dollar and the judges did agree on the condition and the speciality of the car voting it the best GT on the field. But the front lawn this year was certainly dominated by the competition cars as this might have been the best selection ever seen. Early competition cars included the 166 MM/53 Pininfarina Coupé as well as a 250 MM Vignale Spyder standing next to each other but the stars were the 9 open 12-cylinder racers in the middle of the field. One might say that a 250 TR is a rare car but the 2 examples on the field were even on the more common end of the spectrum. Beautifully presented in its original Finish colours of the Scuderia Askolin chassis 0742TR was seen on the field on display after making its post-restoration debute last year in the Ferrari Classiche tent. As well freshly restored in Maranello was the second 250 TR, chassis 0756TR that was already seen at Pebble Beach a few months ago. This car was awarded best Competition car on the field, the second major award of the weekend. Unlike the former two cars the third Testa Rossa was not a privateer car but a genuine works car driven by Hill, Gurney, von Trips and Rodriguez at Le Mans, the Nuerburgring or the Targa Florio. Two of the biggest bore engined Ferrari of the period were the 410 Sport and the 412MI. Coming from the same stable as the winning TR the 412MI was also refreshed recently bringing it back to the silver colour as raced by Phil Hill and Richie Ginther in the US after its short intermezzo as a works racer. The 410 Sport is a well-known contender at the Cavallino Classic being one of the previous winners as seen at the jubilee edition 3 years ago. It came along with one of the top three cars that day on the lawn the trio of Ferrari 335S. At the end of the fabulous history of the Mille Miglia in 1957 it was the 315S and the 335S that brought Ferrari the victory in the last of the legendary road races. 4 examples of the 335S were built or converted from the 315S and with one destroyed only 3 examples exist today and all of them made their way to Palm Beach this Saturday making this an once-in-a-lifetime opportunity to see them all together. Two of them were campaigned by the Scuderia Ferrari in the Sports car Championship 1957 with Chassis 0674 driven by von Trips at the Mille Miglia finishing second overall and 0700 did not finish the race with Collins / Klemantaski driving. The later might be the most famous camera car as the shots of Klemantaski out of the car are certainly legendary. With the restriction to 3 litre engines for the 1958 season the 335S became obsolete but a last example was built for the American racing, featuring an upgraded pontoon-body in style of the 1958 Testa Rossa the last 335S was called the “Super Testa Rossa”. 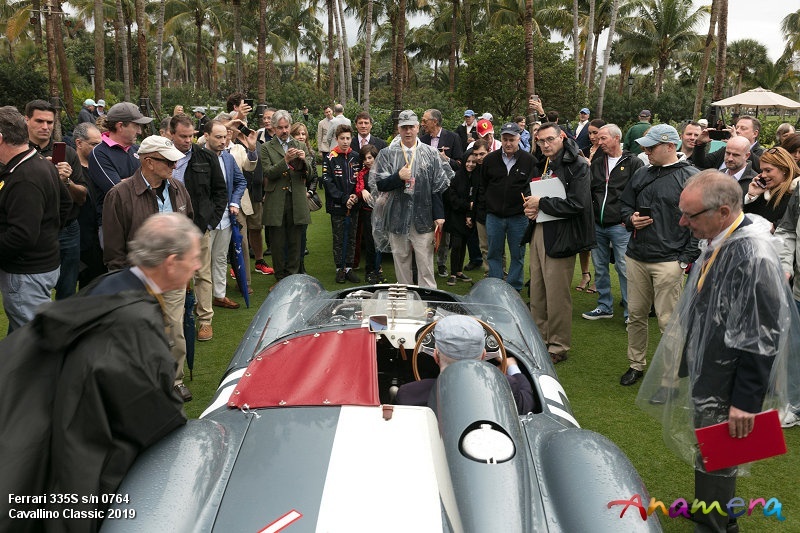 The car made its second appearance in recent years at Palm Beach as it was shown by its owner Andreas Mohringer just after being acquired, still in red. Since then Paul Russell performed an outstanding restoration giving the car not just the class victory in Pebble Beach but more important the overall victory at last year’s Villa d'Este concours. Unlike in previous years the show was not concluded with the two awards of the GT and Competition category but with an extra Best of Show award and the owner of the 335S was the last one called on stage taking the top honours just nine months after the BoS at Lago di Como. As both the Cavallino Classic and the Concorso d'Eleganza are part of the Peninsula Best of the Best award this car will not only be present at the selection in Paris in two weeks selected from the winners in 2018, it should return next year to be again contender for the 2019 winners, a unique double appearance in the young history of the Peninsula Award. With its unique history and the perfect restoration it is certainly a worthy contender and a well representative of the Cavallino Classic. Unfortunately the weather did not suit this year’s edition as for the first time in years the Breakers Concours had to be held in rain. 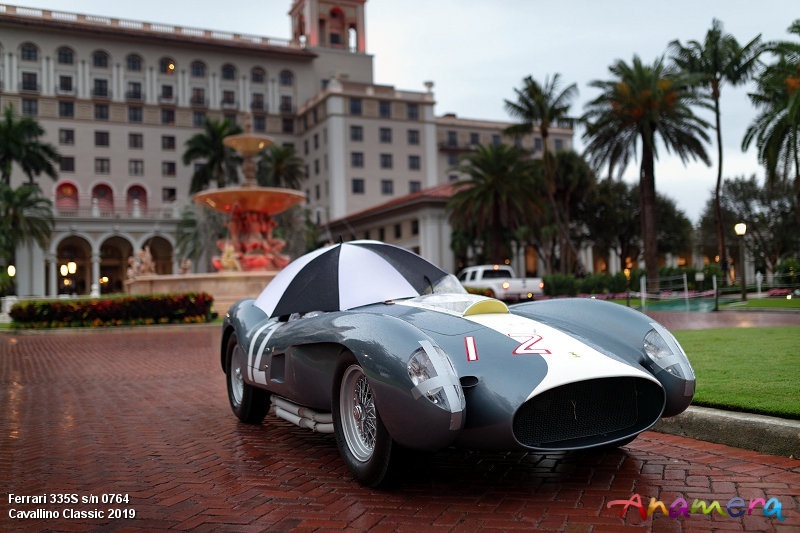 With the weather forecast going in the same direction tomorrow at the Presidents Country Club in Mar-a-Lago this might be one of the wettest editions of the Ferrari event since it was introduced nearly 3 decades ago. 1957 335 Sport 0700 Scuderia N.E. * Please note that many of the spectacular Ferraris on the show field at the Saturday Concorso d’Eleganza were for display only and not judging.